The only thing better than return clients are ones who make you feel like part of the family. Lee and I hadn’t been back to see the Cole’s in a year, but that didn’t stop them from welcoming us into their home treating us like a member of the family (maybe that’s just because they can’t tell who’s related or not anymore), and putting us up for the night. If you’re into ruining the illusion of the image, you can read about details of the shoot, including behind-the-scene photos below. 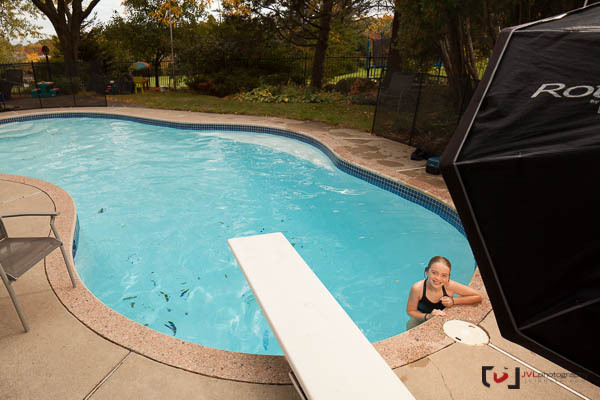 This years concept was put together by all the kids, of course they chose the pool, of course it’s October in Canada. So while it may not make perfect sense to go swimming in 8 degree “heat” the pool was warm enough that they all stayed in the water once one was done shooting. We tried to start with the mermaid further back, but because of the wide-angle optic (24mm) she was minimized so we brought her, and the others, more forward. Potential alternate for the eldest boy, we wanted options knowing the baby was too cranky to be outside. In the end we went for him holding his brother upside-down. You can read about last years shoot here and you can view this image larger on Flickr. Also, to achieve the almost infinite depth of field, I used my 24mm tilt-shift lens, and tilted the front element down extending the focal plane horizontally along the line of the pool, rather than a set depth in front of the camera and out to a distance. You can read about the Canon TS-E 24mm f/3.5 II L at my CanonRumors.com Review. Posted on Tuesday, October 9th, 2012 at 9:02 pm. Filed under: Extreme Family, Portraits Tags: Cole, Commercial, Extreme Family, Family, Flare, Lights, Pool, portrait, Swimming	RSS 2.0 feed. this is really cute! love this.